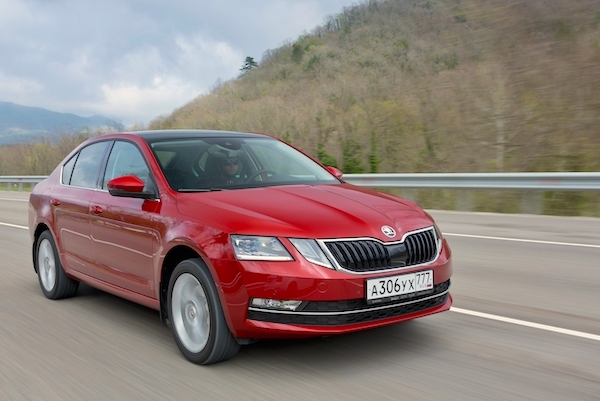 The Skoda Octavia posts an 8th win in the past 10 years in Poland. Consult over 25 years of Polish Historical Data here. New light vehicle sales in Poland enjoy a 6th consecutive year of growth in 2018 at +9.8% to a record 600.583 units including light commercials. According to BSCB archives this is the first time the Polish market reaches 600.000 annual units. The Polish market has the particularity to be almost completely controlled by fleet: private sales only represent 25.9% of the 2018 volume at 155.535 units vs. 74.1% for company sales at 445.048. Petrol sales represent 65.8% of the market at 405.328 units, diesel is at 32.4% and 194.555 and EVs at just 0.1% and 680 units. The Top 4 best-selling brands all outpace the market, starting with an unchanged podium: Skoda (+12.2%), Volkswagen (+17.8%) and Toyota (+11%) ahead of Ford (+12.3%) leapfrogging Opel (-0.9%) and Renault (+1.5%). Dacia (+14.1%) and Mercedes (+25.3%) also progress in the remainder of the Top 10 while Kia (+8.3%) almost matches the market and Fiat (-6.1%) drops three spots to #10. Hyundai (+13.4%), Citroen (+11.9%) and Peugeot (+11%) also shine below. After giving up its throne to its smaller sibling the Skoda Fabia (+2.9%) in 2017, the Skoda Octavia (+12.5%) reclaims the Polish pole position for the 8th time in the past 10 years – and ever, with the Opel Astra (-3.6%), VW Golf (+7.3%) and Toyota Yaris (+10.7%) ensuring the Top 5 remains immobile. The Toyota Auris (+14.6%) lodges the largest gain in the Top 10, overtaking the Ford Focus (+1.9%) to hit #6. Outside the Top 10, the VW Polo (+36.6%), Opel Insignia (+32.5%), Toyota Aygo (+32.4%), Renault Master (+31.3%), Skoda Citigo (+29.8%), Dacia Sandero (+28.7%), Hyundai i30 (+26.6%), Ford Fiesta (+26.5%), Toyota Corolla (+25.1%) and Seat Leon (+23.5%) make themselves noticed while the Skoda Karoq is the only 2017 launch to end its first full year in market within the Polish Top 50. Full Year 2018 Top 15 brands and Top 50 models vs. Full Year 2017 figures below. Full December 2018 Top 15 brands and Top 50 models below.